Laszlo Nyiro - the name which is linked to our women’s tournament from the year 2013. We have 10th years anniversary so there is probably no better person to ask about recent years in Trnava than him. "My first memory of Trnava goes about 20 years back, when one leg of the Slovak Satellite was played here in the University courts. I came to know the EMPIRE club much later and luckily found the great partners. First of all, there was Mr. Hlavna who readily accepted all of my advice and gradually upgraded this tournament from a 25K level to the present 100 thousand category," said Mr. Nyiro in the interview. 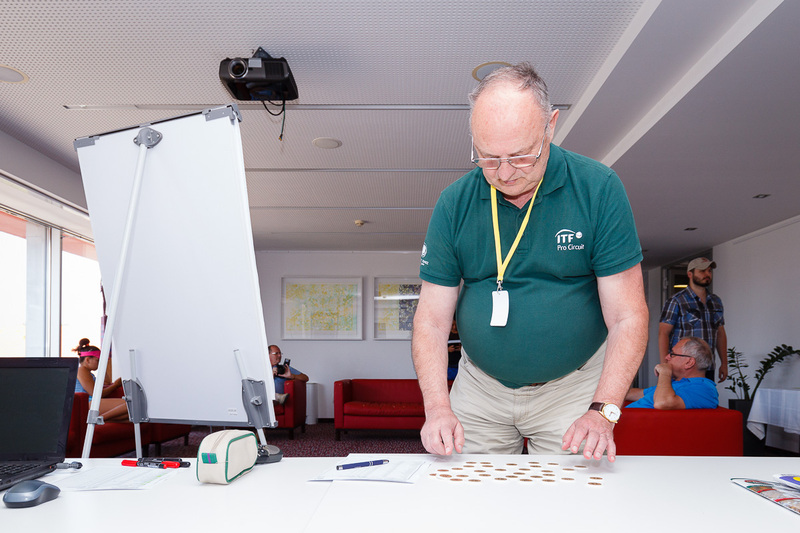 How long have you been doing your job and how have you become the tournament supervisor? "The present system of training, educating and certifying tennis officials for professional tournaments was first established in the early 80-ies of the last century. The international federation then began to organize schools and they gradually replaced the "amateurs" with pro umpires and referees. I am proud to be the first ever tennis official to receive this Pro License in the 'Eastern Block'. This happened in 1984, and as such, today I am one of the longest-serving active members of my generation." What special education do you need for this job? "Nowadays the ITF runs international schools for the officials who had already gained some years of experience in their own country. Good command of English is a must, and so is a high level of knowledge of all the rules and regulations. After passing the test, successful candidates receive a so called "white badge". This is the first grade of the ladder. After another 3-4 years and having accumulated considerable international experience, selected referees may be accepted to a higher level of school, and those who survive a tough examination are certified as "silver badge" supervisors. This badge entitles the holders to work as supervisors in the lower category (15-60 thousand USD) professional tournaments. The top of the grade is the "gold badge", which is awarded to silvers after many years of reliable service. Only gold badges can supervise events with 100 thousand or higher." At which tournaments, except for Trnava, do you work as the supervisor? Can you choose where do you want to be the supervisor? "The ITF Pro Circuit events may propose their supervisor from a list and then the invited person has to be approved by the ITF. In this way, we have some input where we prefer to work. My CV includes a wide range of all levels of activities and roles in tennis. In my younger years I worked a lot as a Chair Umpire in top events, I did ATP Tour finals, even participated in Wimbledon and the Olympics. I have been the referee in 45 different Davis Cup ties in 24 different countries, did several European Individual and Team Championships and Senior World Championships. I never counted them, but the number of my WTA tournaments surely exceeds a couple of dozen. The oldest venue in my work history is of course Hungary, but I am sure that the runner up position goes to Slovakia. Here I helped the organizers to set up the first ever dollar prized tournament in 1988. This was the Slovak Satellite, established by Jan Kukal and Ivan Lichner." When you compare your first year in Trnava and the last one so far, the year 2017, what has been the greatest improvement since then? And what has changed? "My first memory of Trnava goes 20 years back, when one leg of the Slovak Satellite was played here in the University courts. I came to know the EMPIRE club much later and luckily found great partners, first of all, there was Mr. Hlavna who readily accepted all of my advice and gradually upgraded this tournament from a 25K level to the present 100 thousand category. It is difficult to remember all the changes and improvements that took place in the meantime, but for me, the most important factor is the constant effort to do everything better and better." During the tournament, you need to work with computer almost all the time. Can you describe your usual day in Trnava? "Indeed, our admin work is highly computerized, which is a big advantage, but tends to fix us to our seats too much. In the mornings I usually kick off with a short meeting with my colleagues, assign them to their respective courts and matches. They prepare the electronic devices they are using on court, then double-check if everything is in place for the start of matches (courts, players, ball-kids, etc.). Once the matches are on, I need to monitor if the live-scoring system is running well and if I see a problem, I need to come to the court and solve it. When a match is finished I prepare the prize-money sheet for the loser. In the meantime, I make the first draft of the program for the following day, to be discussed and changed many times before we agree on a final version. Players often need help to get medical certificates or need to get in touch with other tournaments for withdrawal, or arrival details, so I offer my assistance for them." Do you also watch some tournament matches in Trnava online or directly on the court? Do you remember the best one in Trnava, or one of the bests? "As I mentioned above, I need to follow all the matches online, at least the scores. Whenever possible, I love to sit out on the restaurant terrace and watch the center court live and in the meantime think back of the good old days, when there was no computer, no live-scoring, and we were able to sit comfortably on the stands all day and enjoy tennis. If you ask me about my "best memory", I would recall a real dramatic situation four years ago. We had a rainy week and of course it was raining all day on Sunday. There were two excellent players in the final, one of them local (Anna Karolina Schmiedlova, other was Strycova). We had to face a brutally difficult decision, where to force the players to go indoors and finish on a different surface with no TV and no spectators, or to keep them on site until Monday. Both of them had already had their tickets to fly to the next tournament and their coaches were pushing them to go. Finally, Slovak Television helped to solve the problem, they offered to change their schedule and cover the final on Monday 5pm (fantastic contribution! ), so we all came back on Monday afternoon, and had a great final with a full house of spectators." What do you like about Slovakia, how do you feel here in Trnava? “I like absolutely everything about Slovakia. I love the mountains and hills, rivers and valleys, I love the food and I love the people. Above all, I feel very lucky to be gifted with the basic command of the language which I find beautiful. In Trnava I feel at home from the very first moment. I take pleasure in strolling along the old streets, breathe in the atmosphere of history and sit on one of the terraces to enjoy a cup of coffee." What do you think, what does the tournament in Trnava need to improve in order to be one the best tournaments in the world? Or, in your opinion, is it already one of the best tournaments? "Considering the conditions of the clubhouse, courts, and all the premises, I think this tournament has reached its optimal limits. One can speculate if it would be worth to jump one grade up and become a WTA Tour event. Certainly, it would require some investment, and the sharp raise of the budget. The question is: what do the Slovak players need the most? What do they benefit from? Which group of players is your target, is it the two top ones, or do you want to provide the opportunity for the next generation at home?" If you are not supervising the tournament, what do you do, what are your hobbies? "Up until 2016 I did officiating in full swing, which means I spent some 180 nights a year in hotels and often stopped at home only to change suitcases between two tournaments. Over 70 years of age, now I decided to slow down, travel maximum to 9-10 tournaments. At home I enjoy the company of my family, do small jobs around the house, garden and wine cellar, listen to music, watch sports on TV, so I do all the things retired people normally do, and...and can hardly wait for the next tournament to come."